I’m super excited about the skirt tutorial I’ve got for you today. 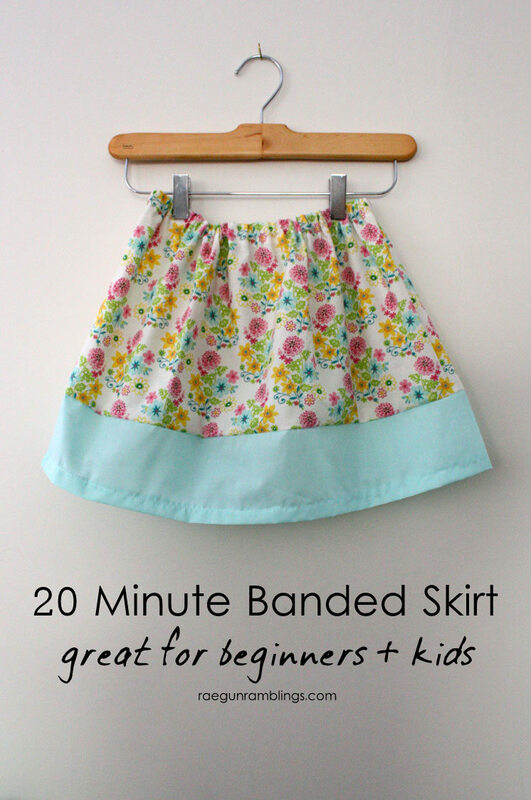 This 20 Minute basic banded skirt tutorial is one of my go to projects for teaching people to sew. In fact aside from sewing on scraps these skirts are the first thing my nieces made. Now they have both made multiple skirts for themselves and have helped their friends to make them too. This is a great project for beginners and those in a hurry because it’s just a few straight lines. You can simplify the skirt even more by doing it without a band but in addition to adding an extra about of cuteness I like that it gives the new sew-er an extra long length to practice sewing. 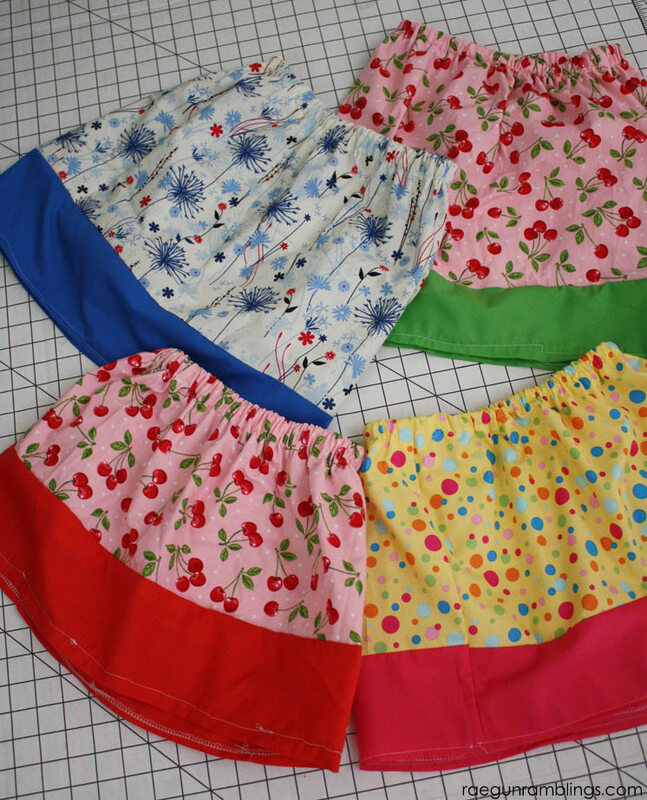 For these skirts I like to use quilting cotton for beginners but if you’re comfortable with sewing it will work with any fabric you want. Whether I make this skirt for an adult or a child I always use the full width of the fabric for quilting cotton usually 44 inches. If the width of your fabric is longer there is no need to cut it down it will just be a little more gathered. Now measure from where you want the waistband to sit and where you want the fabric to end on your leg for example the right above the knee. From that number subtract 2 inches. This will be the length of fabric you want for your main fabric. Your band fabric will be 5 inches by the width of the fabric (usually 44 inches). Obviously this will have a different look for adults and children but I like how it looks on each and you can definitely do math to adjust your band with (taking a few inches from one fabric and adding it to the other). For your elastic you want to measure around your waist and make it a so it has to stretch. I usually subtract 4 inches from my waist measurement. With right sides together (that is the pretty sides) align the main fabric and the band fabric and sew down the long edge using a 1/2 inch seam allowance (that means from the needle to the edge of the fabric it should be 1/2 there is probably a mark on your sewing machine). Finish the raw edges with a serger or a zig zag stitch (when I teach kids I do this step for them). Fold back the band. With right sides together match the short ends of the fabric together. Make sure your seam line is lined up. Pin in place or if you’re confident you don’t need to pin, beginners should pin though. With a 1/2 inch seam allowance sew down the short edges to make one big tube. Finish both edges with a serger or zig zag stitch (I do this step for the kids). Iron the edge of the band side under wrong side together 1/2 inch and sew down with a 1/4 seam allowance (usually lining the fold of the fabric with the edge of your presser foot). Iron the top edge of your skirt under wrong side together 1 inch. Sew down with a 3/4 inch seam allowance making sure to leave about a 1-2 inch hole to insert the elastic. Over lap the ends of your elastic one on top of each other about 1/2 inch and sew back and forth 3-4 times. Sew the hole closed in your elastic band by sewing over where your stitches left off over the space of the while and where your stitches start again. Wear your skirt with pride (or try it on your favorite skirt recipient). These skits above were sewn by my 6 and 8 year old sewing students. They aren’t perfect, you can see little jags in the stitching but they are all theirs and SO awesome! Niece L trying on the first skirt she made under her dress when she was still 5 years old! As a bonus these banded skirts are so quick and easy they make great gifts. 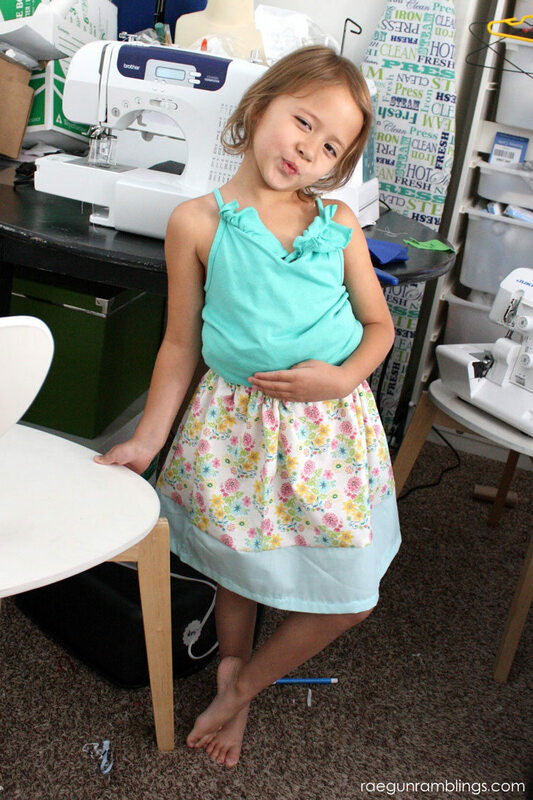 The best part is since you can find so many different basic quilting fabrics including all kinds of character and licensed designs you can make an awesome skirt that you’d never find in a store. 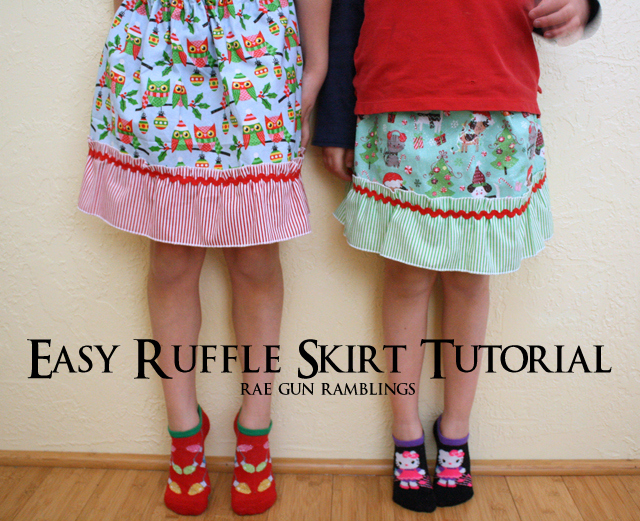 Once you master the banded skirt you should give the Ruffle Skirt tutorial a try! Want even more skirt tutorials? 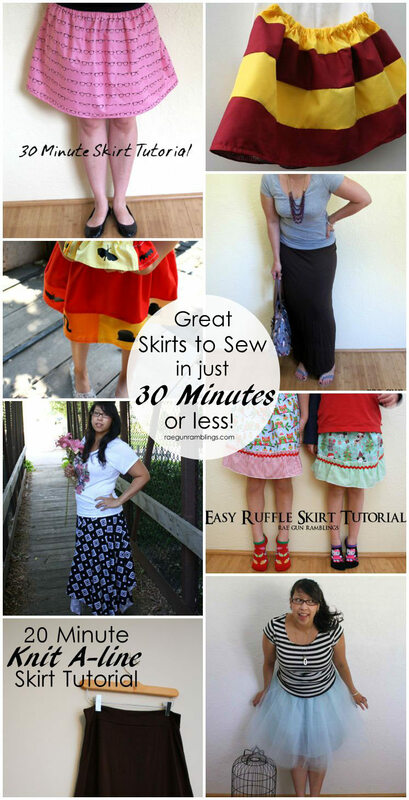 All of these skirts can be sewn up in 30 minutes or less! Oh Anne you are the sweetest but it’s true I do love a speedy project haha. So cute! She def has more talant than me! Ha! I would love for you to stop by on Mondays and share at our Something to Talk About link party! Hi, I’m here from Inspire Me Monday. You had a 5 yr old do it??? Wow, you are a brave woman! But, I love that it proves it’s easy!! Really cute! A nice mother daughter project. Thanks for sharing on the Living with Style linky Party! 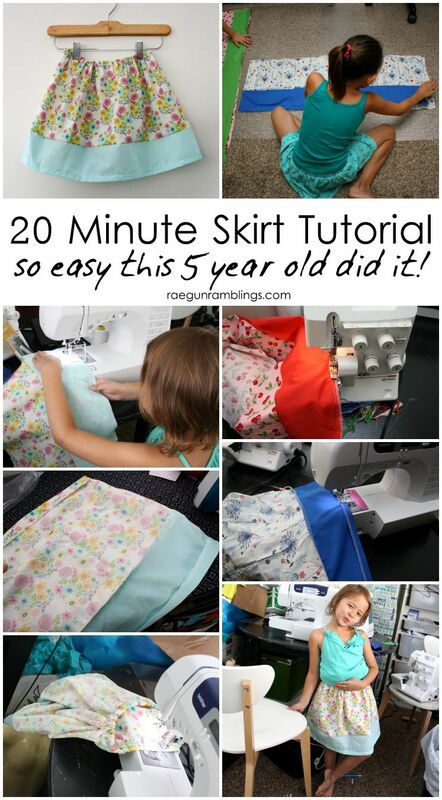 Great tutorial and the skirt is adorable! Can’t believe a 5 year old did it! awesome! Thanks for stopping by the party Marissa! i hope you will share each week! Such an awesome beginner project. She is adorable & so is the skirt. Perfect timing for this post – my 3 year old will only wear skirts and dresses! Have any super simple dress posts?? I am so glad I found your blog – I’m your newest follower. You had me at YA book lover! I teach 6th grade, and all I read are YA books (completely by choice, of course, I love them!) Thanks so much for linking up with us at Dream. Create. Inspire. Link. Of course, I’m pinning this! Amazing tutorial. I just might try this for my grand daughter! Thanks so much for sharing at The Living With Style Linky Party! Have a great day. Hello, I just wanted to thank you for posting such an easy to follow tutorial! I used it to create a skirt for my Christmas work party, which looked amazing and attracted a few compliments! I’ve written a blog post about it for my website in which I’ve given credit for the pattern, it’s in this link here : http://www.laurakirk.co.uk/#!blog/clh2. Thank you! Oh I love hearing that. I’m excited to go see pictures on your blog. THanks SO much for sharing!!! Hi. Thank you for sharing this project to us. Was that cutey pie your niece? 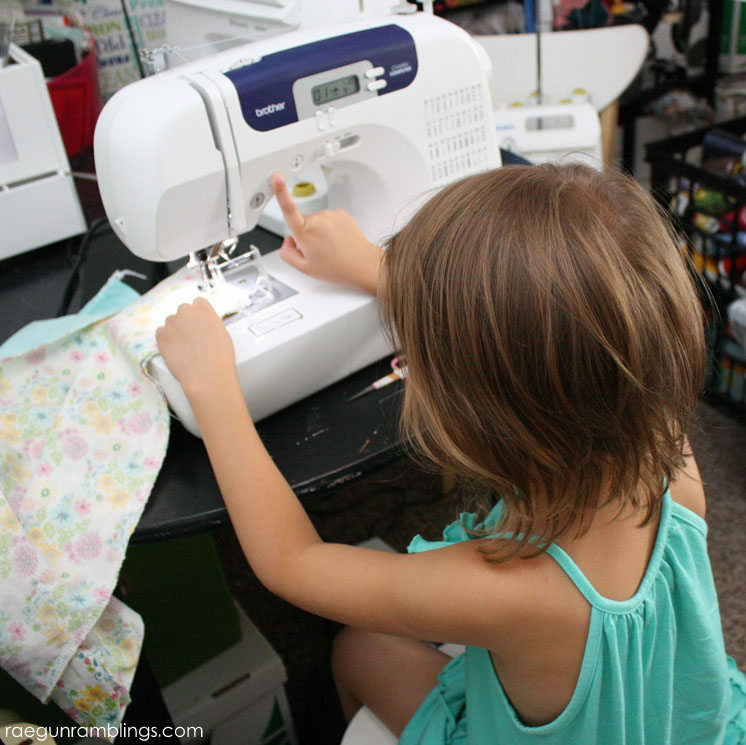 What a lovely activity for lilttle girls who love sewing. 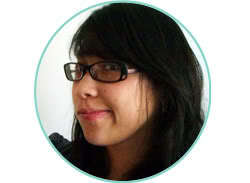 Sandra you’re awesome! It is my niece. Thanks so much for the feature, I’ll be sharing your post on my FB as well as The Daily Seam FB page this week! Be back soon here for more sewing goodness.